Hi guys, I'm back from my trip, but still very busy. I have programmed a casing length calculator and thought it might be useful to you. It tells you what length of casing to use for a given weight of sausagemeat. If you read this spuddy, and think it worth it, perhaps you would like to host it for me. To read the help files. Start the program and press the F1 button on your keyboard. I recommend you read them. I have not tested this program on Windows Vista, so if anybody who has vista tries it, please let me know if it works OK.
Last edited by Oddley on Fri Aug 24, 2007 9:32 pm, edited 2 times in total. That's brilliant it'll be really useful - I always soak far too much casing 'cos I never know how much i'll use - this will actually save me money. Worked OK in Vista for me. Only thing was that it downloaded as casing without the .exe on the end of the filename. About your program - very useful indeed. Do you think it might be possible to add a calibration for different diameters of casing - i.e. hogs can range from 32-38mm (or more). Sheeps can be 18-22 or so etc. I am glad it works on Vista. The program can be made to what I want it too. With enough time. You can experiment yourself, with different casing sizes, and enter different lengths in the settings box on the program, to do what you want. Thanks all for the welcome back. Nice work Oddley and welcome back. I'll upload it pemanently to my server and change the link. Just wondering is there any way to change this to Lb's since I am in the US and we still do not use the metric system yet. If you multipy your pounds of meat by 454 this gives you the grams to input. Thanks that is nice and easy. Very useful Oddley, thanks. Great to see you back. Thanks Oddley, for this useful little program. 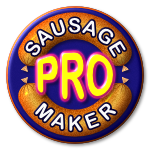 Thanks for the program, im doing my first batch of sausage today and had no idea how much casing i'd need so the program worked a treat! Feet & Inches = 16' 6"
Feet & Inches = 5' 6"
Which is a bit odd because the cm and metre figures are equivalent! I obviously don't know what you used to write your program but I would hazard a guess that it's something to do with the way the metres value string is assembled. It looks to me as if it's truncating any leading zeroes in the decimal part of the value (does that make sense? ).